Valkee Ltd has filed its 2/2014 balance with the tax office just hours before the last deadline on 27th June 2014. It seems they had every reason to keep it private as long as possible. However, yesterday Valkee’s results became available. Interestingly, the press remains silent so far. The disaster is worth reporting. Valkee’s sales are down 44,3% from 1,941 million in 2/2013 to 1,080 million Euros. The scandinavian campaign last winter has not paid off, it seems. The Valkee 2 must be a total flop. Loss grew by more than factor 10 to 2,919 million. Loss is therefore nearly x3 the revenue. Debt grew by a million to 2,55 million. Last year, Valkee told on all media channels they had acquired a giant 7,4 M investment from old investors and abroad. The balance tells only of 3,456 M and 1,75 M in new shares. Where is the rest they promised? Capital left was 843.000 843 T€. Public funding by TEKES was all the years booked as “Other income”. 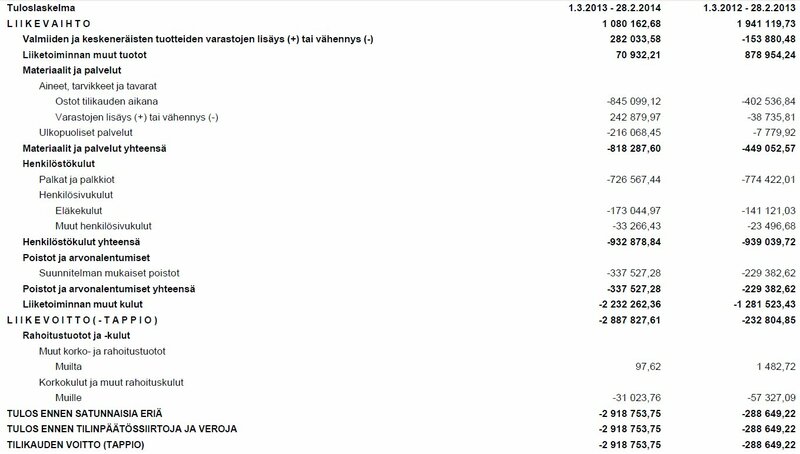 Last year Valkee got over 878.000€ tax money. This is down to 70.000 71.000 which would mean that state funding has practically stopped. Some of the journalists have been in contact with earlightswindle.com. Radio Helsinki gave Valkee’s “CSO” Juuso Nissilä massive air time in a 2-hr program. The trashy interview included strange remarks about this site and this blog, may be commented later. Nissilä admitted, that this website has had a central part in Valkee’s downturn. Pekka Somerto, CEO of Valkee Ltd, told that it’s nothing special for a company to have ups and downs (! ), and that the result was within the acceptable range – because Valkee had not gone for new markets in the last fiscal year. Somerto lies to the press, at least that is then business as usual. 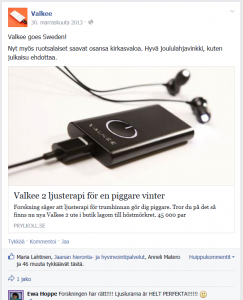 Valkee expanded to Norway and Sweden last winter: An epic fail. The Paholaisen Asianajaja-blog was able to confirm that TEKES funding for Valkee has stopped. The agency told that already. Thx Juha for the cross-check!